Are you struggling with your hard floor cleaning? If you do, please call our company and we will help you with this back-breaking chore. We are a cleaning services provider and we take pride in our cleaners and our speciality, which is hard floor cleaning and polishing service, and we dare say it is the best one you will find here in W6. We are offering you a very professional and very affordable service for help. Call us as soon as possible. When you choose our company, you are choosing professionalism, efficiency and reliability. 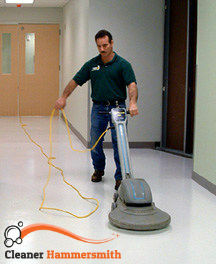 We are offering you a very convenient for you hard floor cleaning service. You can hire our service for your home or your office. With our service you will save yourself money and time. By choosing professionals to clean your hard floors, you can rest assured that your floors will be cleaned quickly, efficiently and safely. We can guarantee you that your hard floors, regardless of their material will be cleaned to a high standard. We can clean all kinds of stone floors – limestone, marble, terracotta, terrazzo – and all kinda of tile floors – tile and ground, ceramic, quarry, etc. Trust us with your hard floor maintenance. 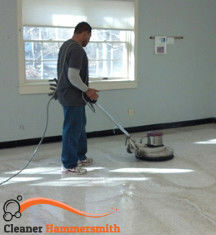 We will not only get rid of stains, dust and grime from your hard floors, we will also give them a nice finishing touch. Our cleaners will polish your floors after cleaning them, thus leaving them look brand-new. Please do not hesitate to call us any time. Take advantage of our offer- the best hard floor cleaning and polishing service in Hammersmith, W6 for a very budget friendly price.